Color sets the mood for any event, and choosing the perfect color scheme for your party linen rentals can help you design an elegant, festive occasion. It takes more than just picking a favorite color, however, to create a coordinated color scheme that will enhance your event without being distracting or dominating. 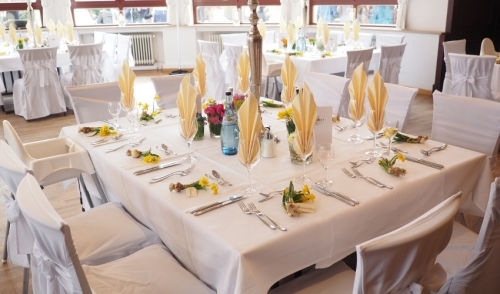 When choosing colors and planning a color scheme, you must consider the mood of your event. Colors ought to reflect that mood, as well as the function of the occasion, and different shades are better for different types of events. A solemn memorial wake, a professional business luncheon and an exciting baby gender reveal may all use blue as a base for the color scheme, but the hues will be very different. Darker, more muted tones are best for solemn, somber or reflective events, while bolder shades have more energy and confidence for a productive atmosphere. Brighter, snappier colors are energetic, celebratory and happy, while pastel hues evoke a sense of nostalgia, wistfulness and gentleness. Temperature is another aspect of color to consider when setting a mood. Cooler shades such as blues and greens are more restful and relaxing, while warmer tones like reds, yellows and oranges are somewhat more vibrant and empowering. When choosing colors and designing a color scheme, consider the setting where the colors will be used. Coordinating your colors with the natural background, whether it is a garden, park or other outdoor landscape or a ballroom, reception hall or indoor venue, will help you design a sophisticated, eye-catching event. Many venues that host a wide range of events will be decorated in neutral tones in order to accommodate many color options, but more specialized locations may require more deft color coordination to blend seamlessly with your party linen rentals. Consider the colors of any flooring or groundcover, flowers, paint or trim, light fixtures, wall coverings and other decorations, as well as furniture, and choose your colors accordingly. Once you have selected a base color for your overall scheme, add a pop of contrast to draw out the rich hues and catch the attention of your guests. Boldly contrasting colors on opposite ends of the color wheel are a popular option, or you might choose much darker or lighter shades in the same color family. Metallic and neon hues are also great choices, but should be used sparingly to avoid an overwhelming or garish result. If you have opted for neutral base colors, bolder shades will work well as accents, but avoid choosing more than one or two accent colors or you risk a color scheme that will look too haphazard for an elegant or coordinated appearance. No matter what colors you choose, it is important to pair the right color with the right linen for a well-coordinated party. Larger, background linens such as tablecloths, wide runners, draperies and chair covers are best in more neutral, subtle shades and will form the base of your color scheme. Use your accent colors for smaller, more flexible linens such as napkins, thin runners, chair bows, overlays or ribbon accents. If you are using more than one accent color, consider alternating how the different accents are used to keep the overall palette balanced and ensure no one area is overwhelmed with a single shade. Color can be the key to a memorable, elegant event, no matter what type of party you are planning. By choosing the perfect color scheme for your linen party rentals, you set a bright and beautiful tone for your celebration and create a picture perfect setting for your guests.